The top panel shows the symmetry of the first natural quasicrystal, icosahedrite. The lower panel shows the symmetry of the recently discovered quasicrystal, which has not yet been named. Credit: Source: Paul Steinhardt et al. A team from Princeton University and the University of Florence in Italy has discovered a quasicrystal—so named because of its unorthodox arrangement of atoms—in a 4.5-billion-year-old meteorite from a remote region of northeastern Russia, bringing to two the number of natural quasicrystals ever discovered. Prior to the team finding the first natural quasicrystal in 2009, researchers thought that the structures were too fragile and energetically unstable to be formed by natural processes. "The finding of a second naturally occurring quasicrystal confirms that these materials can form in nature and are stable over cosmic time scales," said Paul Steinhardt, Princeton's Albert Einstein Professor of Science and a professor of physics, who led the study with Luca Bindi of the University of Florence. The team published the finding in the March 13 issue of the journal Scientific Reports. 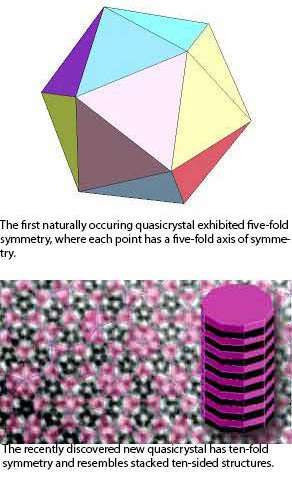 The discovery raises the possibility that other types of quasicrystals can be formed in nature, according to Steinhardt. Quasicrystals are very hard, have low friction, and don't conduct heat very well—making them good candidates for applications such as protective coatings on items ranging from airplanes to non-stick cookware. The newly discovered quasicrystal, which is yet to be named, has a structure that resembles flat 10-sided disks stacked in a column. This type of structure is impossible in ordinary crystals, in which atoms are packed closely together in a repeated and orderly fashion. The difference between crystals and quasicrystals can be visualized by imagining a tiled floor: Tiles that are 6-sided hexagons can fit neatly against each other to cover the entire floor. But 5-sided pentagons or 10-sided decagons laid next to each will result in gaps between tiles. "The structure is saying 'I am not a crystal, but on the other hand, I am not random either,'" Steinhardt said. Crystals with these forbidden symmetries had been created in the laboratory, but it wasn't until 2009 that Bindi, Steinhardt, Nan Yao of Princeton and Peter Lu of Harvard reported the first natural quasicrystal, now known as icosahedrite, in a rock that had been collected years before in Chukotka, Russia. To confirm that this quasicrystal, which has the five-fold symmetry of a soccer ball, was indeed of natural origins, Steinhardt and a team of scientists including geologists from the Russian Academy of Sciences traveled to the region in 2011 and returned with additional samples which they analyzed at the University of Florence; the Smithsonian Museum in Washington, DC; the California Institute of Technology; and the Princeton Institute for the Science and Technology of Materials (PRISM) Imaging and Analysis Center. The ordered yet non-standard pattern of the quasicrystal is revealed by an electron beam, which enables a view of a pattern of spots with ten-fold symmetry. Credit: Source: Paul Steinhardt et al. The researchers confirmed that the quasicrystal originated in an extraterrestrial body that formed about 4.57 billion years ago, which is around the time our solar system formed. They published the results in the Proceedings of the National Academy of Sciences in 2012. "Bringing back the material and showing that it was of natural origins was an important scientific barrier to overcome," Steinhardt said. 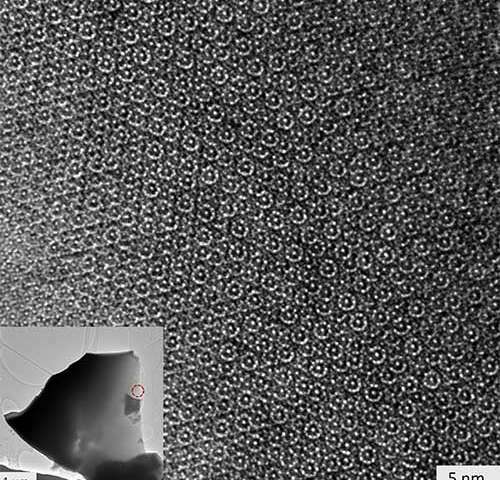 This new quasicrystal, which was found in a different grain of the same meteorite, has 10-fold, or decagonal, symmetry. It is made up of aluminum, nickel and iron, which normally are not found together in the same mineral because aluminum binds quickly to oxygen, blocking attachment to nickel and iron. The researchers are now exploring how the mineral formed, "We know there was a meteor impact, and that the temperature was around 1000 to 1200 degrees Kelvin, and that the pressure was a hundred thousand times greater than atmospheric pressure, but that is not enough to tell us all the details," Steinhardt said. "We'd like to know whether the formation of quasicrystals is rare or is fairly frequent, how it occurs, and whether it could happen in other solar systems. What we find out could answer basic questions about the materials found in our universe." Scientist 1: and to think a thousand years ago our records show that at the height of the first information age no one recognized a data storage drive when they encountered fragments of alien space craft ruins. They properly categorized the quasi crystals but without the intact devices they never considered that they might be alien in origin. The perfection in their orderliness outdoing naturally occurring crystals by 5 orders of magnitude almost clued them off. But if nature is the easier answer, who can blame them for missing the other clues. If it were not for confirmation of lost spacecraft in our system by our new alien friends, we may never have revisited the data and realized we excavated their craft millennia ago.